The White Bear River waterfall has a massive amount of water rushing over the rock ledges until it settles down into a pool where a man stands waist high in the water with his fly fishing rod. This river is a prime location in Southern Labrador to catch some of salmon which are talked about by many of the fishermen. 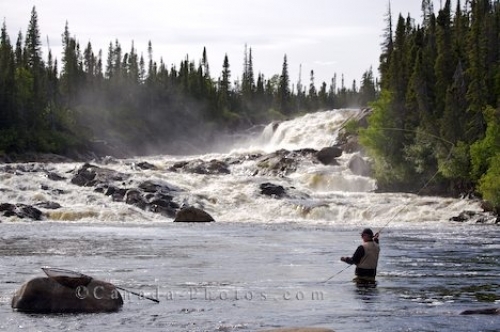 Picture of a man fly fishing in the calm waters of the White Bear River in Southern Labrador as the waterfall crashes above him.